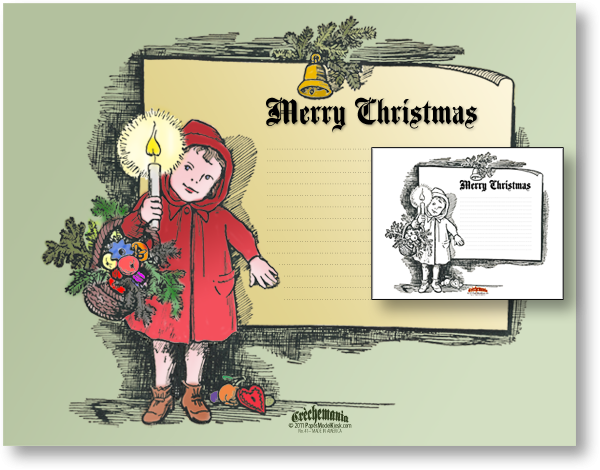 Perfect for your child's letter to Grandma — or Santa — a Premium Download with five 10 8.5 x 11 pages in color and five for your child to color. You get 10 different pages for your children to enjoy: five in color, and five in B & W that your young artists can have fun coloring. A beautiful Italian letterine di Natale, a child's Christmas letter. There's even a version of the Child's Christmas Letter in Greek. American children may have written beautiful letters at Christmas, but they didn't have Vittorio Pranziniand Elisabetta Gulli grigioni,authors ofSanti Auguri! — to lovingly documented them. Vittorio and Elizabetta's Letterine di Natale, Letters of Christmas (Edizioni Essegi) contains beautiful children's letters like the one shown at left from Vittorio's collection. Cari nonnini, "Dear Grandparents" begins one such letter from Vittorio's collection,non voglio lasciar passare la piu bella festa dell' anno… "I will not let the most beautiful celebration of the year pass without writing to tell you that I love you…"
And not just the sentiments, but the letter itself: such wonderful penmanship, and only one misspelling — a missing "n" in the word mantenga, "because." Look at the flowery embossing, that attached 3-D little paper nativity! A holiday does not go by when my cutting mat and tools aren't found at the kitchen table along with the guests and the treats. I hope thisletterine di Nataleand the Christmas Letter to Color — & Write brings out the crayons and pencils — right along the turkey and ham. And in homage to my long-ago students in Greek School, I could not resist including an extra page in our Premium Download with ÎšÎ±Î»Î¬ Î§Ï�Î¹ÏƒÏ„Î¿Ï�Î³ÎµÎ½Î½Î±! — Merry Christmas, in Greek. And for all of you who didn't have the fun of recitingAlpha, Beta, Gamma, Delta as children, don't worry: our Premium Download gives you "Merry Christmas" in three different beautiful fonts! In fact, there are even blank versions of a Child's Christmas Letter — in color and in B & W — for our young artists, writers and calligraphers. Count 'em! 10 different version for you to print (5 in collor, 5 in B & W) so your child can practice his coloring and his writing! Size: 11 x 8.5 inches.